Artist's concept of Cassini approaching Saturn. With its flyby of Phoebe, the Cassini spacecraft has completed the first satellite flyby in its four-year tour of the Saturn system. NASA's Deep Space Network received confirmation at 7:52 a.m. PDT today. The spacecraft is operating normally and is in excellent health. 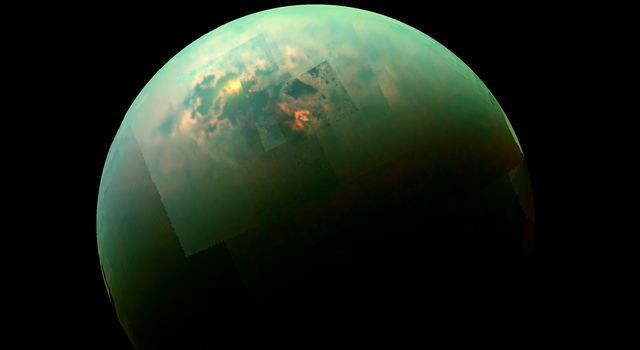 "One down, 52 to go," said Jeremy Jones, chief navigator for the Cassini-Huygens mission at NASA's Jet Propulsion Laboratory, Pasadena, Calif. During Cassini's planned four-year tour it will orbit Saturn 76 times and execute 52 close encounters with seven of Saturn's 31 known moons. "Although this is the first flyby in the Saturn tour, it is the only opportunity to see Phoebe," said Dr. Dennis Matson, project scientist for the Cassini-Huygens mission. "This flyby is key to knowing more about the mysterious odd-ball, which has been the object of interest of many scientists." Cassini came within approximately 2,068 kilometers (about 1,285 miles) of the dark moon on Friday, June 11. The spacecraft was pointing its instruments at the moon during the flyby. Several hours later it turned to point its antenna to Earth. The signal was received through the Deep Space Network antennas in Madrid, Spain and Goldstone, in California's Mojave Desert. It was traveling at a relative speed of 20,900 kilometers per hour (13,000 miles per hour) relative to Saturn. It's been 23 years since we last visited Phoebe. The Voyager 2 flyby in 1981 was from 2.2 million kilometers, (about 1.4 million miles), 1,000 times further away. When it was discovered in 1898, Phoebe was Saturn's outermost known moon. That changed with the discovery of several smaller moons in 2000. Phoebe is almost four times farther from Saturn than its nearest major neighbor, Iapetus, and substantially larger than any of the other moons orbiting at comparable distances. With a diameter of 220 kilometers (about 140 miles), it rotates on its axis every nine hours and 16 minutes and it completes a full orbit around Saturn in about 18 months. All of Saturn's moons except for Phoebe and Iapetus orbit very nearly in the plane of Saturn's equator. Phoebe's orbit is highly eccentric and retrograde; it orbits backwards with respect to the direction of the other moons. 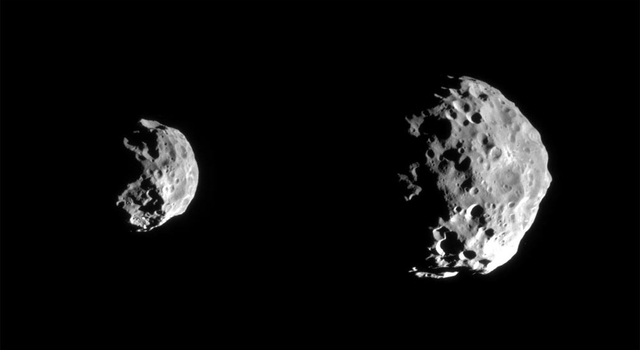 Based on data from the Voyager flyby, Phoebe resembles a sort of dark asteroid. It may be very primitive. "All previous indications suggest that it may be a captured Kuiper Belt object, one of the millions of asteroid-like bodies from outside the orbit of Pluto," said Dr. Bonnie Buratti, scientist on the Cassini-Huygens mission at JPL. "With the flyby behind us, we may soon know whether Phoebe's composition is unmodified since the time it was formed in the outer solar system. 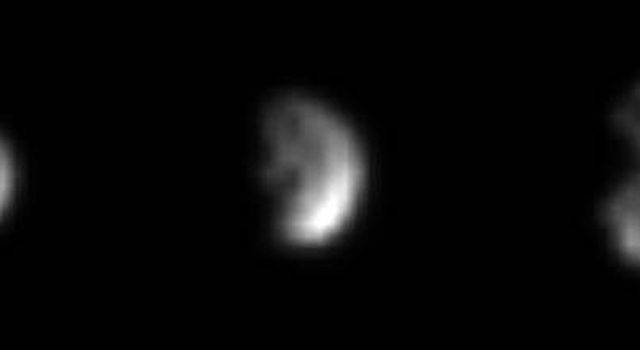 If it turns out to be a Kuiper Belt object, we could be looking at the most detailed close-ups of any such object ever taken." First pictures after the flyby are expected later today. After the Phoebe flyby, Cassini is on course for Saturn. A last trajectory correction maneuver is scheduled for June 16. Cassini will fire its engine for 96-minutes before going into orbit around Saturn on June 30 in U.S. time zones (July 1 Universal Time). The Cassini-Huygens mission is a cooperative project of NASA, the European Space Agency and the Italian Space Agency. 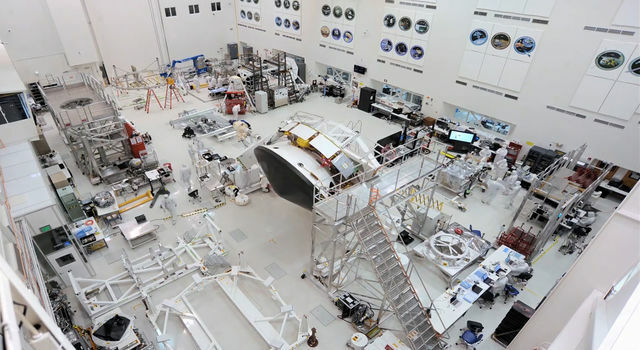 The Jet Propulsion Laboratory, a division of the California Institute of Technology in Pasadena, manages the Cassini-Huygens mission for NASA's Office of Space Science, Washington, D.C. JPL designed, developed and assembled the Cassini orbiter. For the latest images and more information about the Cassini- Huygens mission, visit http://saturn.jpl.nasa.gov.